Shadow Magic and Clockwork Kings! The Crossroads region is the heart of Midgard. Here’s where you’ll find the alleys of Zobeck, the mighty dwarven cantons, the dark pathways of the Margreve forest, the undead principalities, and the subterranean empire of the ghouls. 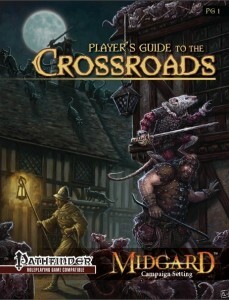 The Players Guide to the Crossroads has new options for those who seek adventure and fortune in this exciting realm! The Shadowsworn Class: a 20-level class of roguery and shadow magic, with 7 new spells! Master the secrets of the Crossroads region and unleash its new spells, feats, and mysteries! Is this material gleaned from the Campaign Setting book, or is it all-new? It looks like there’s some material that is in the Campaign Setting book- the race stats and some regional description, for example- with some expanded upon. There’s also a good amount of all-new material, like new traits, feats, bloodlines and shadowsworn class (great job with that, btw- looks like a lot fun). I dig Pat Loboyko’s cover (which is in the MCS). Pretty cool, and lots to contribute to a PFRPG Midgard campaign. Take my money! TAKE IT! There’s a bit of duplication (maybe 10% of the content) so that the materials players need are collected in one place. 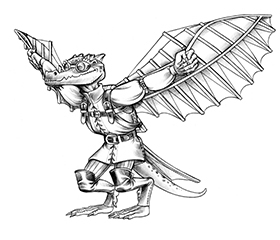 Mainly in the Kobold race and the Gearforged race, and a few of the weapons are also found in Zobeck Gazetteer. 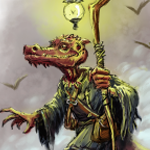 There are spells, feats, and items from the original Gazetteer and other supplements collected in this pdf and updated to Pathfinder. New stuff is in the book, too!!!! Ok, just looked through it. Artwork is awesome as usual (love the Paladin of the Undying Sun, darakhul and new gearforged) and the text is great – lots of new feats, spells and flavor to keep your Midgard unliving and breathing…. I love this. It is nice to see some of the things that did not quite make it into other products here as well as a lot of new stuff. If all of the players’ guides are this good I am going to need some more money.